Christa Clips Joins Common Cents Mom Blog! I’m thrilled to announce a new partnership that I’ve forged with Hollie Pollard of Common Cents Mom! I’ll be writing regularly on her blog and we will be co-hosting the weekly #cdnmoney twitter chat each Tuesday evening at 7pm Eastern time. By combining our savings strategies and frugal lifestyle tips, we will be working together to help you SAVE even more! 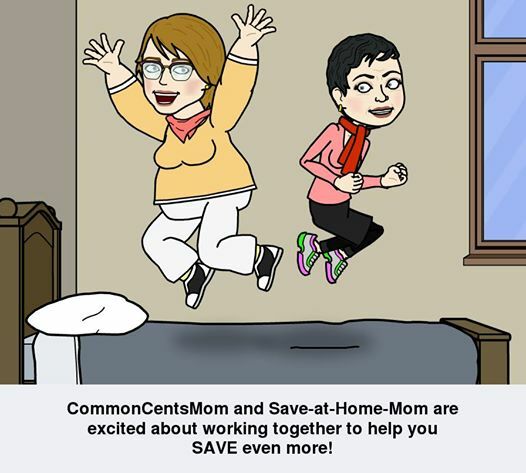 Common Cents Mom and Save-at-Home-Mom are a natural fit: we both aim to be savvy with our money, whether it’s making wise decisions in long term spending, saving, & investments (more Hollie’s specialty than mine) or day-to-day savings at the grocery store and around the home (my preferred niche!). We’ll be working hard to bring you the best information to make sure you’re saving money in all facets of your lifestyle! Hollie was one of the first savvy spending tweeps that I connected with on twitter. With a handle like @commoncentsmom, I knew right away that we spoke the same language! We met in real life when I was volunteering at the She’s Connected Social Media Conference in Toronto in 2012. I was new onto the blog scene (read: I’d had a blog for 4 days!) was worried that I was too small of a fish to attend the conference. By volunteering at the registration desk for the morning, I earned a full day conference pass, made some valuable connections, and could truthfully boast that I “doubled* my blog followers” by volunteering that day! We reconnected last fall at the Blissdom Canada Conference and have now decided to combine our time and talents to make sure that our saving tips and mindful money message is being heard far and wide! I’m super excited about working closely with Hollie and invite you to check out our collaborations over on Common Cents Mom blog. I’ll also be linking to our blog posts and twitter chats here on ChristaClips: Save-at-Home-Mom blog and my facebook page. Posted on February 7, 2014, in Christa Clips, Common Cents Mom and tagged Christa Clips, Common Cents Mom, frugal lifestyle blogging. Bookmark the permalink. Leave a comment.